A new National Bureau of Economic Research (NBER) working paper by Afendulis, Chernew, and Kessler says yes. If this working paper holds up to peer review, these findings will offer an important endorsement of the Medicare Advantage program. 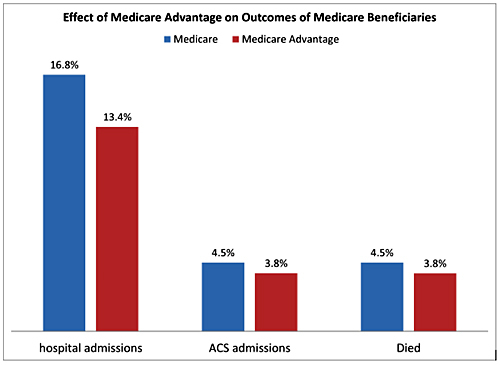 The paper attributes large and striking reductions in all hospitalizations (22%), hospitalizations for ambulatory sensitive conditions (18%), and mortality (15%) to Medicare Advantage as illustrated in the graph below. The authors argue that their results provide evidence that private Medicare Advantage plans are more efficient than traditional Medicare. But, I will provide an alternative explanation and an important caution after reviewing their approach. What is clever about the paper is that they have devised an analytical method that successfully avoids the criticism that better outcomes among Medicare Advantage beneficiaries could be attributed to healthier enrollees. They do this by exploiting a quirk in Medicare Advantage payment policy called the "urban floor": Medicare Advantage pays health plans more to cover beneficiaries who live in counties that are part of metropolitan areas with populations of 250,000 or more. The difference in payment rates means that plans have a greater incentive to enroll beneficiaries in counties just above versus just below the cutoff. Turns out that residence in these counties is a good instrumental variable because it is a strong predictor of enrolling in Medicare Advantage, but not correlated with unobserved determinants of service use and health. Thus, the authors have cleverly designed a pseudo-randomized study to assess the effect of Medicare Advantage by comparing outcomes of enrollees in counties above and below the "urban floor". The incremental enrollment in larger counties, induced by higher payments and not by unobserved differences, allows the authors to identify the effect of Medicare Advantage on the use of medical services and the quality of care for the incremental enrollees. But while this is a good instrument it does leave open the possibility that the additional government expense (estimated at roughly $48/month per beneficiary in the above-the-cutoff counties) that creates the "urban floor" may drive the health gains rather than private health insurance. But readers of this article should be mindful of the fact that it is a working paper so the paper has yet to have the benefit of peer review. There is a technical issue that must be addressed before these implausibly large results can be believed. The data they use come from a Medicare file of all hospitalizations that are available to researchers. Up until 2008, the hospitalizations for Medicare Advantage beneficiaries were not provided on this file because they were viewed as unreliable and thus comparisons between traditional Medicare and Medicare Advantage have not been possible. This study uses the 2009 hospitalizations, an early year in the experiment to make data on all hospitalizations available to researchers. I contend that their findings, which are inexplicably large in magnitude, are attributable to the lower reporting levels for Medicare Advantage enrollees. The reliability of the tracking hospitalizations in Medicare Advantage using their datasource must be benchmarked and verified before one should conclude that Medicare Advantage can produce better outcomes. Dan Polsky, PhD, MPP, is a University of Pennsylvania Professor of both Health Care Management at the Wharton School and Medicine at the Perelman School of Medicine, and Executive Director of the Leonard Davis Institute of Health Economics.